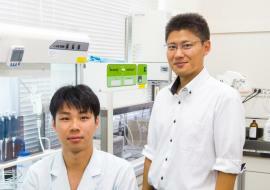 Toyohashi University of Technology has, in cooperation with Kanazawa University, discovered the aggregates of a hydrophilic-polymer-modified lipid in a lipid bilayer membrane. A contradict phenomenon that the aggregated bulky polymer appeared lower in the atomic force microscope topography was discovered, and related causes were revealed. These findings will lead to further understanding of the function of glycolipids and membrane proteins. The research results have been published in the May 23, 2017 edition of Langmuir.